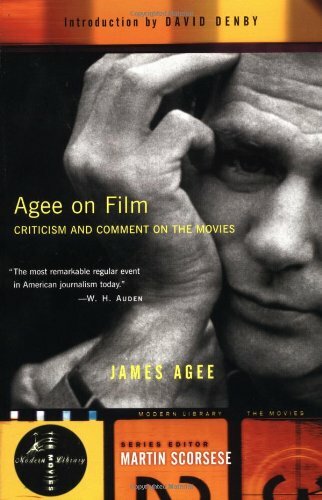 Buy Agee on Film, by James Agee. Agee was the father of American film criticism. Although he was a contemporary of Otis Ferguson and Manny Farber, he was perhaps the most influential -- so much so that his review of John Huston's The Treasure of the Sierra Madre; (1948) got him hired to write the screenplay Huston's 1952 The African Queen. Agee on Film collects Agee's criticism from 1942 to 1948, from both The Nation and Time. It's fascinating to see Agee's week-by-week prose, burying deeper into movies with a very small amount of space than most critics ever get in their lifetimes. He could take a beautiful movie like Jean Renoir's The Southerner, praise it for its virtues, but drive a nail into exactly what did not work about the film. His most breathless essay is his three-part exaltation of Chaplin's Monsieur Verdoux, which is just about worth the price of the book all by itself. Another of his greatest reviews, praising the great Curse of the Cat People (1944), is here as well. This recently re-issued book also contains lengthy essays on Sunset Boulevard and D.W. Griffith and an appreciation of silent comedy. I re-read this book in 2005 and now consider it the most valuable film book written in English. The out-of-print Agee on Film Vol. 2 collects Agee's screenplays, including The African Queen and the brilliant The Night of the Hunter. (1955).